LANCE (Land, Atmosphere Near real-time Capability for EOS) is a group of five near real-time data systems serving the Land and Atmosphere science community. What is near real-time (NRT) data? Near real-time is data that is available to users 3 hours or less after observation. What near real-time systems are a part of LANCE? LANCE consists of NASA's Goddard Earth Sciences Data and Information Services Center (GES DISC), Level-1 and Atmosphere Archive and Distribution System (LAADS DAAC), Advanced Microwave Scanning Radiometer Science Investigator-led Processing System (AMSR SIPS) and Ozone Monitoring Instrument SIPS (OMI SIPS). Standard products are products that are used for standard science processing and are generally available between 8-40 hours after observation. What is the difference between near real-time and standard products? Near real-time and standard products differ in the amount of processing the raw data receives. Near real-time data is processed with different, less accurate ancillary data to make it available to users within 3 hours of observation. The main difference is in geolocation due to the use of predictive orbit information vs waiting for definitive orbit information. Where can I obtain standard products? Each LANCE element provides standard products as well as near real-time products. Go to the Standard Products page for the data centers where the standard products are archived. What LANCE data products are available? Where do I go online to search and order LANCE data? AIRS, AMSR2, MLS, MODIS and OMI near real-time data are available through the individual elements. Go to the Near Real-Time Data page for more information. Who can order LANCE data products? All NASA Earth Observing System (EOS) mission data including LANCE data is freely available to the public. How long are LANCE near real-time data sets are available? The near real-time data sets stay for about 7 days from the time they are generated. How soon are LANCE near real-time data sets available? The near real-time data that LANCE provides is available to users within 3 hours of observation. Do I need to register to access LANCE data? Yes, registration is required to obtain LANCE data. Please visit the Earthdata Login to register for a username and password. Will there be a fee associated with accessing data? Typically, there is no cost associated with accessing NASA Earth Science data. However, please refer to the Earth Science Data Systems (ESDS) Data and Information Policy for more information. Who do I contact for support with LANCE data? For questions about LANCE or user registration, contact Earthdata Support. How do I stay informed about updates, announcements, data issues and scheduled maintenance? Subscribe to receive notifications from LANCE about updates, announcements, data issues and scheduled maintenance. What is the difference between Corrected Reflectance vs. Surface Reflectance Imagery? For both MODIS and VIIRS the Corrected Reflectance algorithm utilizes Level 1B data (the calibrated, geolocated radiances). It is not a standard, science quality product and is available only as near real-time imagery. The imagery can be visualized in Worldview and GIBS. For MODIS the sensor resolution is 500 m and 250 m (Bands 1 and 2 have a sensor resolution of 250 m, Bands 3 – 7 have a sensor resolution of 500m, and Bands 8 - 36 are 1 km. Band 1 is used to sharpen Band 3, 4, 6, and 7), imagery resolution is 250 m, and the temporal resolution is daily.The purpose of this algorithm is to provide natural-looking images by removing gross atmospheric effects, such as Rayleigh scattering, from MODIS visible bands 1-7. The algorithm was developed by the original MODIS Rapid Response team to address the needs of the fire monitoring community who want to see smoke. Corrected Reflectance shows smoke more clearly than the standard Surface Reflectance product. In contrast, the MODIS Land Surface Reflectance product (MOD09) is a more complete atmospheric correction algorithm that includes aerosol correction, and is designed to derive land surface properties. In clear atmospheric conditions the Corrected Reflectance product is very similar to the MOD09 product, but they depart from each other in presence of aerosols. If you wish to perform a complete atmospheric correction, please do not use the Corrected Reflectance algorithm. An additional difference is that the Land Surface Reflectance product is only tuned for calculating the reflectance over land surfaces. The VIIRS Corrected Reflectance imagery provides continuity from the MODIS Corrected Reflectance imagery and was developed to provide natural-looking images by removing gross atmospheric effects such as Rayleigh scattering from the visible bands. By contrast the Surface Reflectance product is available in near real-time and as a standard product. Surface Reflectance provides a more complete atmospheric correction algorithm that includes aerosol correction and is designed to derive land surface properties. in clear atmospheric conditions the corrected reflectance product is similar to the SR product but they depart from each other in the presence of aerosols. MODIS stands for Moderate Resolution Imaging Spectroradiometer. The MODIS instrument is on board the Earth Observing System (EOS) Terra (EOS AM) and Aqua (EOS PM) satellites. The orbit of the Terra satellite goes from north to south across the equator in the morning and Aqua passes south to north over the equator in the afternoon resulting in global coverage every 1 to 2 days. The EOS satellites have a ±55 degree scanning pattern and orbit at 705 km with a 2,330 km swath width.The MODIS instrument provides 36 spectral bands from wavelengths of 0.4µm to 14.4µm. For more information, please visit the NASA MODIS website. When were the Terra and Aqua satellites launched? Terra (EOS AM) was launched 18 December 1999 and Aqua (EOS PM) was launched 4 May 2002. High quality hotspot/active fire observations are available from the Terra satellite starting November 2000 and from the Aqua satellite starting 4 July 2002 onwards. What time does the satellite pass over my area? Terra (EOS AM) passes over the equator at approximately 10:30 am and 10:30 pm each day, Aqua (EOS PM) satellite passes over the equator at approximately 1:30 pm and 1:30 am. The sun-synchronous orbit allows the satellites to pass over the same area at the same time in every 24 hour period (at every 99 minute orbit the satellites cross the equator at the above mentioned times; every other spot on Earth has similarly constant overpass times). The time of satellite pass will vary according to your location. 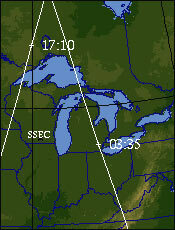 To estimate when the satellite will pass over your area, you can use the satellite overpass predictor provided by NASA. Daily Terra and Aqua global and regional orbit tracks are provided by the Space Science and Engineering Center (SSEC) at the University of Wisconsin-Madison. The maps show a series of white lines with tic marks showing what time the satellite will pass over a certain location on the Earth. The white lines represent the center of the swath and the tic marks and time show at what time in UTC the satellite has passed over that location. Please refer to the MODIS Rapid Response System FAQ for more information: What do the orbit track maps show? How often are data acquired? The MODIS instrument on board the Terra and Aqua EOS satellites acquire data continuously providing global coverage every 1-2 days. Therefore there are at least 4 daily MODIS observations for almost every area on the equator – with the number of overpasses increasing (due to overlapping orbits) the closer an area is to the poles. See What time does the satellite pass over my area? What are MODIS Data "Collections"? A MODIS data Collection is a MODIS data version. When new and improved science algorithms are developed, the entire MODIS dataset (from launch) is reprocessed and then tagged and distributed as a new "Collection". During the process of a Collection, an attempt is made to use the same version of the Science Algorithms or Program Executables (PGEs). However, sometimes a bug is found in one or more of the PGEs in the middle of Collection processing; and if the bug is not serious, processing will complete with the new corrected PGE. These anomalies and problems in processing are noted on the Known Problems page. One can always identify the Collection number for a particular HDF file as it's always included (as a 3 digit number) as part of the HDF filename. There have been six MODIS data Collections (or Versions) processed since MODIS/Terra was launched in early 2000. The Collection versions created thus far are 001, 003, 004, 005, 051, 006 and 06.1. MODIS Collection 6.1 (C6.1) was added in October 2017 to correct a number of issues in the Collection 6 (C6) Level-1B (L1B) data. The decision to create a new improved C6.1 was driven by the MODIS Atmosphere team to address a number of issues in the current C6 L1B data. These L1B issues had a negative impact in varying degrees in downstream MODIS Atmosphere Level-2 (L2) and Level-3 (L3) products. More information can be found at https://modis-atmosphere.gsfc.nasa.gov/documentation/collection-61. Starting in November 2017, C6 Land processing stream will use the C6.1 L1B as input, with no change to the land-science processing algorithms. We do not expect to see any significant impact to most land products from using upstream C6.1 as inputs except for some minor differences in Terra MODIS snow and sea-ice products because of differences in the Terra cloud mask. Therefore, C6 processing of NRT Terra- and Aqua-MODIS Land products will continue until sometime around the middle of 2018, when C6.1 processing of Land products will start. VIIRS stands for Visible Infrared Imaging Radiometer Suite (VIIRS). The VIIRS sensor was launched aboard the joint NASA/NOAA Suomi National Polar-orbiting Partnership (Suomi-NPP) satellite on October 28th, 2011. It crosses the equator at approximately 13:30 PM (ascending node) and 1.30 AM (descending node). The 3,040 km VIIRS swath enables ~15% image overlap between consecutive orbits at the equator, thereby providing full global coverage every 12 hours and mid-latitudes will experience 3-4 looks a day.VIIRS has 5 high resolution Imagery channels (I-bands), 16 moderate resolution channels (M-bands) and a Day/Night Band (DNB). The VIIRS detectors have a constant angular resolution that results in an increasing pixel footprint size as the scan is further from nadir (see figure 1 below). This means the actual area of each scan has the shape of a bow-tie, as consecutive scans overlap away from nadir. The bow-tie effect is reduced during processing through a combination of aggregation and deletion of overlapping pixels. What VIIRS products are available in LANCE? The VIIRS I-band (375 m) Active Fire product and Corrected Reflectance imagery are the newest near real-time products available through LANCE. More will follow. The active fire product will be available in FIRMS and images created from these data products, and Corrected Reflectance images are now available through GIBS for viewing using EOSDIS Worldview and similar clients. The new VIIRS images available through GIBS are Corrected Reflectance (True Color; Bands M3, I3, and M11; and Bands M11, I2, and I1) and Fires and Thermal Anomalies (day/night). Rapid Response is being replaced by Worldview Snapshots. The new low bandwidth web interface will be replacing the Rapid Response Subsets. Users can select custom bounding boxes and imagery layers with the new low bandwidth web interface. Users will be allowed to save their preferences with a URL and come back to the URL to retrieve their imagery of choice. Please transition to Worldview Snapshots as Rapid Response will be discontinued soon. Where can I find more information on usage guidelines for the Rapid Response images? Please refer to the Rapid Response page. Can I use an image from your gallery for…? All Rapid Response images are in the public domain and can be freely used and reproduced for any purpose. Please credit: “NASA/GSFC, Rapid Response.” If publishing online, please link to Rapid Response. For more information on use and credit, visit the Citation Policy page or contact Earthdata Support. What do the red boxes mean? Thermal anomalies detected on the Kamchatka Peninsula, Russia. 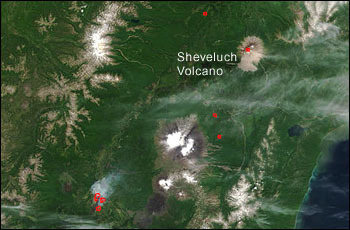 At top right is the heat signature from the Sheveluch Volcano; the remainder are fires. The red boxes indicate the location of a thermal anomaly that was detected by MODIS using data from the middle infrared and thermal infrared bands. In most cases, this thermal anomaly is a fire, but sometimes it is a volcanic eruption, or even the flare from a gas well. We have no way of knowing which it is based on the MODIS data alone. In areas of known volcanic activity, we can verify an eruption using published reports of volcanic activity worldwide. The red outlines don’t represent the actual size of the fire. They indicate the perimeter of 1km-resolution pixels containing the thermal anomaly detected by MODIS. What do the different band combinations mean? A digital color image displayed on a monitor is composed of three different color channels: red, green, and blue. Satellite images are made by combining the reflected light detected by the sensor at various wavelengths (spectral bands) and making them into a single image. The Rapid Response System makes use of MODIS broad range of spectral observations by creating both true-color and false-color images, each tailored to highlight different land surface, atmospheric, and oceanic features. Some of the ways these bands can be combined are described below. True-color imagery uses MODIS Bands 1, 4, and 3, respectively corresponding to the red, green, and blue range of the light spectrum, are assigned to the red, green, and blue channels of a digital image. These images are called true-color or natural color because this combination of wavelengths is similar to what the human eye would see. Natural-looking images of land surface, oceanic and atmospheric features. The 3-6-7 composite assigns Bands 3, 6, and 7 to the red, green, and blue components of a digital image. This combination is good for revealing snow and ice because they are very reflective in the visible part of the spectrum, and very absorbent in Bands 6 and 7, which are a part of the spectrum called the short-wave infrared, or SWIR. 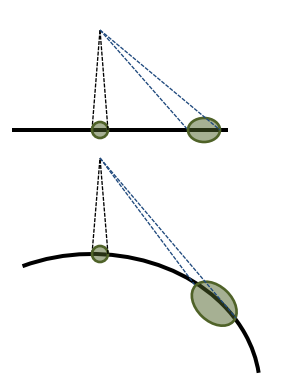 Vegetation is absorbent in Band 3 and Band 7, but reflective in Band 6, and so will appear greenish in this band combination. Bare soil will appear bright cyan in the image since it much more reflective in Band 6 and Band 7 than Band 3. Liquid water on the ground will be very dark since it absorbs in the red and the SWIR, but small liquid water drops in clouds scatter light equally in both the visible and the SWIR, and will therefore appear white. Sediments in water appear dark red. Distinguishing liquid water from frozen water, for example, clouds over snow, ice cloud versus water cloud; or floods from dense vegetation. In this composite, MODIS Bands 7, 2, and 1, are assigned to the red, green, and blue portions of the digital image. This combination is most useful for identifying burn scars. If vegetation burns, bare soil in the area will become exposed. Band 1 slightly increases usually, but that may be offset by the presence of black carbon residue. The near infrared (Band 2) will become darker, and Band 7 becomes more reflective. When assigned to red in the image, Band 7 will show burn scars as deep or bright red, depending on the type of vegetation burned, the amount of residue, or the completeness of the burn. As with the 3-6-7 composite, water will appear black. Sediments in water appear dark blue. Burn scar=Red to reddish-brown, depending on the nature of the pre-fire vegetation and the severity of the burn. Distinguishing burn scars from naturally low vegetation or bare soil. Enhancing floods. What do the orbit track maps show? A cut-away from an orbit track map showing the Terra satellite overpass time near the Great Lakes (daytime granule starting at 17:10 UTC, nighttime granule starting at 03:35 UTC). The maps have a series of white lines with tick marks on them that show what time (using Coordinated Universal Time, or UTC) the satellite will be passing over a particular location on Earth on a given day. The white lines represent the center of the swath. The time stamps mark the start of the northern (Terra) or southern (Aqua) edge of each 5-minute data collection period. An image acquired at that location will span roughly 1150 kilometers on either side of the tick mark. Every day there are two passes over most areas: one daylight pass, and one nighttime pass. At this point the Rapid Response System produces images for the daylight passes only. How can I tell when MODIS will capture an image of my area? A link to the day’s orbit track map appears next to the satellite/instrument name on the Near Real-Time (Orbit Swath) Images page. The orbit track maps have a series of white lines with tick marks on them that show the time in Coordinated Universal Time (UTC) at which the satellite passes over that location. To find your area of interest, find the closest swath and note the times of the nearest tick marks encompassing your area. The image created at a particular time will encompass an equal area on either side of the line. Depending on how close the exact location you are interested in is to the actual orbital line (which represents the center of the swath), your image may be very sharp, if it is near the center, or degraded, if it is close to the edge. For every region there will be a daylight and nighttime pass. Only the daytime (i.e. local daytime) passes appear on our real-time production page. The Near Real Time (Orbit Swath) Images are labeled with a time stamp that is the start time of a five-minute data collection period or granule (its northern edge for Terra or southern edge for Aqua). They are arranged in their approximate geographical position on the earth. Select a subset group from the MODIS Subsets page. Select a red square that covers your region of interest. Why do the real-time images look different from the gallery images? 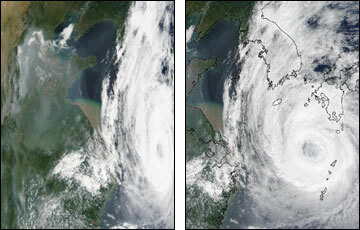 Matching images of Typhoon Rusa from the summer of 2002, showing the bow-tie effect (left) and geometric correction (right). Satellite sensors collect data by pixels. A pixel of data represents the electromagnetic energy reflected from or radiated by a given area of ground. All these pixels are like individual boxes in a grid, and they are put together to make the complete image. In a single rotation of its scan mirror, MODIS captures an area on Earth about 2300 kilometers wide by 10 kilometers tall (imagine a long, thin rectangle). An image is put together by stitching one scan–one strip–on to the next. Because the area is so large, MODIS is looking straight down at the Earth in the center, but is looking off to the side at an angle. Just like the spot illuminated by a flashlight becomes wider the farther away the beam is pointed, the pixels that make up the MODIS image get wider the farther they are from the center of the image. Each MODIS scan gets stretched out at the edges, making the shape of each scan–each strip of the image–look more like a bow-tie than a true rectangle. Because the strips are wider at the edge than the center, the scans don’t overlap in the center of the image, but they do overlap near the edges of the swath. This overlap creates a “double-vision” effect on the edges of the swath, as each point of the Earth’s surface appears in two adjacent scans. This geometric distortion also makes the line where scans come together more pronounced, essentially magnifying tiny differences between one side of the scan mirror and the other, especially at the edge of the swath. The real-time images are displayed as they are scanned by MODIS, without correction for geometric distortion. Since the observed pixels at the edge of the swath are bigger than they are in the center, they appear to be scrunched into a too-small grid box when displayed “as-is” in the real-time imagery. We select certain images for geometric correction, and hand tailor them for our image gallery. How do you correct for the bow-tie effect and distortion? The code we use to correct for the bow-tie effect and distortion is not documented for distribution, but there are several free tools that will give similar results. We recommend the MODIS Swath to Grid Toolkit (MS2GT), HDFLook, or HDF-EOS To GeoTIFF Conversion Tool (HEG). How do I make true-color MODIS images? To help you create your own true color MODIS images, we provide a MODIS true color tutorial (PDF) that tells you where to get the software you need, including a version of our corrected reflectance, fire detection, and vegetation index algorithms. Because of regulations on code distribution, code distribution is handled by the Direct Readout Laboratory. Other alternatives for geometrically correcting MODIS data include MS2GT, HDFLook, and HEG. I’ve tried making my own MODIS images from MOD09 data ordered from LAADS Web, but they don’t look like yours. Why not? We make our imagery directly from the MODIS L1B data (the calibrated, geolocated radiances), not the standard MODIS surface reflectance product (MOD09). Our images are based on custom corrected reflectance code that has been developed with the specific aim of maintaining image integrity, as opposed to the standard MODIS surface reflectance product, which was developed with scientific integrity as the primary objective. For example, we do not use an atmospheric correction. In some cases, our images undergo additional hand-tweaking to enhance their appearance; for example, we may apply different color stretchs depending on the type of phenomenon (e.g. dust, phytoplankton bloom, clouds) we are highlighting. Can you provide the full data file for an image I like in your gallery? For data appearing on the Near Real-Time (Orbit Swath) Images page, links are provided to the near real-time full spectral resolution files HDF files on the LANCE MODIS FTP site. Links are also provided to the science quality full spectral resolution files HDF files on the LAADS DAAC website. Can you send me geometrically corrected images and fire detections for my area of interest each day? A substantial investment of time and resources is required to provide hand-tailored image processing for specific regions on a daily basis. The Rapid Response System provides these products daily to a small number of partner organizations, including the USDA Forest Service and Global Observation of Forest Cover and Land Dynamics (GOFC-GOLD) partners. These images are available on the MODIS Subsets page. As time and resources permit, we can occasionally respond to requests for coverage of significant events, and we are always interested in discussing the potential for meaningful scientific collaborations. If you are interested in proposing such a collaboration, please contact Earthdata Support. Do you produce fire detections at night? Nighttime fire detections are currently being collected for land regions across the world and are available from the Fire Information for Resource Management System (FIRMS). What is the Julian day? The Julian day, as we mean it, is the day of year (from 1 to 365 or 366). Most remote sensing data sets are identified using this Julian date rather than the calendar date, because it is a more straightforward time scale for automatic processes. Note this is different from the common meaning of Julian Day as in Julian calendar. Where do you get the data used to draw political boundaries and coastlines on your gallery images? This vector information comes from the National Geospatial-Intelligence Agency’s (NGA) Vector Map (VMap) Level 0. It is available from the NGA web site. Where can I find the georeferencing information for your subset and gallery images? The georeferencing information is contained in two places, the More information page and the JPEG worldfile. They are accessible from links on each image page. This page describes the projection used to georeference the image, the latitude and longitude of the image center and corners, and some additional information about the image. If the image is rotated, the “rotation angle” field will be given. Counterclockwise rotation is positive; the image is first projected then rotated. If the pixel sizes are not equal in the X and Y direction. the “x scale factor” will be given; it can also be calculated: x_scale_factor = y_pixel_size / x_pixel_size. Note that the coordinates given for the image corners are for the outside corner of the pixel, and thus will differ by one half of the pixel size from the numbers given in the JPEG World File. Note that the pixel size in the Y direction is negative because the map origin is at the lower left and the image origin is at the upper left. The pixel size is in degrees for the Plate Carree projection and in meters for all other projections. Some GIS and Image Processing software packages will not correctly handle images whose rotation terms (the second and third lines) are not 0.0. How do I use your subset and gallery images in my GIS or Image Processing software package? We are only able to do limited testing with subset and gallery images using GIS and Image Processing software packages and would greatly appreciate any questions, comments, corrections, clarifications, etc. on these instructions from our users. Please send them to Earthdata Support. NOTE: The global fire maps do not have georeferencing information. NOTE: When downloading the worldfile (it is a .jgw file) on Windows computers, some versions of Windows append a “.txt” to the “.jgw” when you download it with “Save as type:” set to “Text Document.” If the worldfile is saved with a “.txt” extension, the GIS program will not be able to find the worldfile. The name of the worldfile must match the name of the image file except with “.jgw” in place of “.jpg.” To prevent this problem when downloading the worldfile in a Windows environment, change “Save as type”: to “All Files”. Also be aware that, when checking the worldfile name using Windows Explorer, in some versions you can’t see the “.txt” if the “Hide extensions for known file types” box is checked in Folder Options. In this case, the file name looks correct when it is not. First download the image (it is a .jpg file) and the worldfile (it is a .jgw file). You will also need to have some of the information from the “Display metadata” link handy. The “Display metadata” link is above the image on the left. Either before or after opening the image in ArcMap, you must set the Layer Coordinate System. The projection is specified by the “projection” in the “Display metadata” page. Set both “Semimajor Axis” and “Semiminor Axis” to the value from the “Earth radius (km)” in the “Display metadata” page. You will need to move the decimal point 3 digits to the right to convert from kilometers to meters. NOTE: Some gallery images cannot be used in ArcView because they are rotated in order to capture more of the scene in a rectangular image. You can determine if an image is rotated or not by checking for the existance of the “rotation angle” keyword under the “Display metadata” link for that image. First download the image (it is a .jpg file) and the worldfile (it is a .jgw file). You will have to replace all the periods in the file names (“.”), except the final one before the extension, with underscores (“_”). You can do this during the download process or afterwards. (Or you can completely rename the files, making sure that the portion before the .jpg and .jgw are identical.) You will also need to have some of the information from the “Display metadata” link handy. The “Display metadata” link is above the image on the left. Make sure the ArcView JPEG Extension is enabled by going to File->Extension and checking “JPEG (JFIF) Image Support”. Either before or after opening the image in ArcView, you must set the View Projection. The projection is specified by the “projection” in the “Display metadata” page. Set “Category” to “Projections of the World”"
NOTE: Some gallery images cannot be used in ENVI because they are rotated in order to capture more of the scene in a rectangular image. You can determine if an image is rotated or not by checking for the existance of the “rotation angle” keyword under the “Display metadata” link for that image. In order to save the new projections you will create, for projections other than Plate Carree, you will need to have a writeable copy of the file “map_proj.txt”. First make a copy of the original ENVI file in your own directory space. (In our SGI installation, the file was found in the directory /usr/local/lib/idl_5.5/products/envi_3.5/map_proj.) Second, you must make this copy of “map_proj.txt” your default copy by selecting File -> Preferences -> User Defined Files… and using “Choose” to select “Default Map Projection File”. You must restart ENVI for the change to take effect. Due to a bug (in some ENVI versions) in specifying some parameters for Lambert projections, you may need to create the projection in the “map_proj.txt” file. Instructions are provided below. The projection is specified by the “projection” in the “Display metadata” page. The “JPEG World File Input Projection” dialog will appear. The value from the “Earth radius (km)” in the “Display metadata” page, followed by a comma. You will need to move the decimal point 3 digits to the right to convert from kilometers to meters. Save the file with the new projection definition and restart ENVI for the change to take effect. Set “Sphere Radius” to the value from the “Earth radius (km)” in the “Display metadata” page. You will need to move the decimal point 3 digits to the right to convert from kilometers to meters. You will asked if you want to save the customized projection to the “map_proj.txt” and, if so, to select a filename and if you want to overwrite. If you saved the projection, the next time you open the JPEG file, you can simply select the customized projection name from the “Select Input projection” box. How do I use the “Search by keyword” feature in your gallery? Each Rapid Response Gallery image is annotated with keywords to aid in finding images of interest. The keywords fall into two categories, geographic, such as country, US state, Canadian province, and water body names, and image subject, such as “fire”, “hurricane”, “phytoplankton bloom”, “volcano”, “dust”, “smoke”, “iceberg”, “snow”, etc. This is a very simple search which searches on a literal string. The search is not case sensitive and the string can contain blanks (e.g. “new mexico”) or partial words. The search input can be multiple literal strings seperated by upper case “OR” (e.g., “hurricane OR typhoon OR tropical storm”). Similarly the search input can be a pair of strings separated by upper case “AND” (e.g., “canada AND fire”). The matching images are displayed with the most recent images at the top of the page. If no matches are found, only the search boxes will be displayed. Some examples of keywords which will not work are city names and continent names. Continent names will return some images from that continent but it will not be a complete list. How can I tell what time a subset image was acquired? To find out when MODIS collected the data used in the subset image, click on “Display metadata (including time of input data)” above the image. Under “5 minute swath data used for this image”, there is a list of the MODIS granules that are included in the image. Click on the time of the overpass in UTC to see the real-time browse image for each granule. The subset images may be composited from data collected in different MODIS overpasses at different times. Because the images cover set geographic regions, not a particular MODIS swath, the automated system that generates the subset images takes data from the overpasses that are closest to being directly overhead. Where overpasses overlap in the high latitudes of the north and the south, data from two or more overpasses (100 minutes apart) may be used to create the subset image. In these cases, a faint line may be visible where the two overpasses meet. White shows where data are not available either because MODIS has not imaged that region yet or because the area is out of the instrument’s range for that day. In equatorial regions, where overpasses do not overlap, MODIS data may not be available for the entire region every day. In these cases, a white wedge where no data were available may separate two MODIS overpasses. How can I set up a direct broadcast system to receive data from the MODIS sensor? The Direct Readout Laboratory can provide more information about setting up a direct broadcast system. You can also find additional information on the MODIS home page. How do I convert to NDVI values from the colors in your NDVI images?